It is over a year since we last visited Darkhill Iron Works and it was lovely to be back there on such a beautiful sunny day. The team split into two groups. 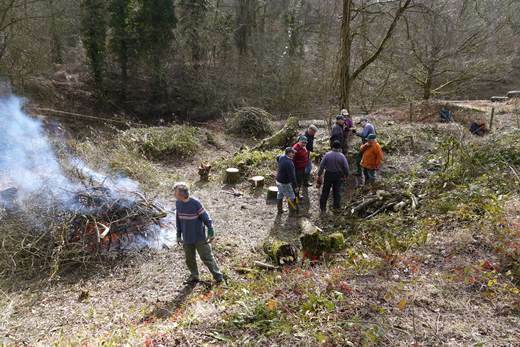 One group were up the hill near to Gorsty Knoll raking and burning the bracken and bramble to open up the ground for plants which would benefit the glow worms. 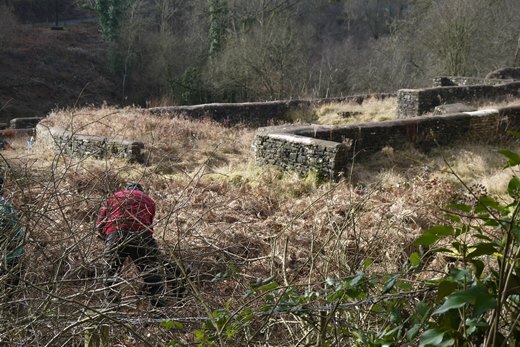 The other group were near to the remains of the iron works clearing some large invasive trees. We were very pleased to be offered hot pancakes by a local resident! 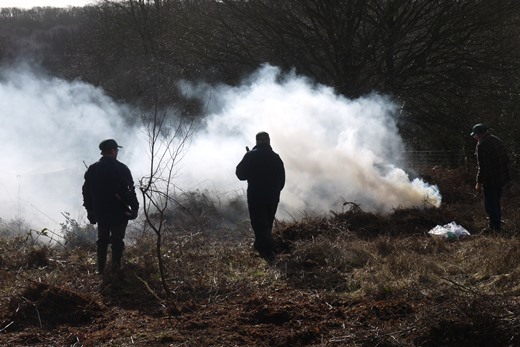 This fire was very smokey as it was burning off the bracken. We were above the Titanic steel works remains and the main track below us was a tramroad which was known locally as a 'dramroad'.Horse drawn wooden wagons with flangeless wheels ran along 'L' shaped cast iron rails. This enabled heavier loads to be hauled than on the rutted roads of the early nineteetn century. Some tramroad blocks can be seen but most are hidden beneath years of rotted leaf mould. The group clearing the trees are at the edge of the Iron Works. This is a site of both national and international importance. David Mushet (d. 1847) brought down the curtain on the Age of Iron. His son, Robert (d. 1891) raised the curtain on the world stage of the Age of Steel Alloys. The remains of the Iron Works are shown here although they continue down the hill. There is also evidence of a self contained brickworks (built pre 1818).